Prescilla Perrichon obtained her MSc in Marine Biology and Ecology from the Mediterranean Institute of Oceanography in Marseille (France, 2010) and received her Ph.D. from the University of La Rochelle (France, 2014) under the supervision of Prof. Paco BUSTAMANTE. 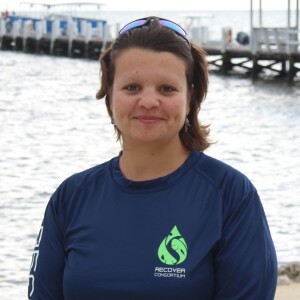 She is now a Postdoctoral research associate on the RECOVER project working with the Developmental Integrative Physiology Research Cluster at the University of North Texas, Department of Biological Sciences. Prescilla’s research focused on understanding how early oil exposure from the DeepWater Horizon impacted the developing cardiac system of three resident fish, the salt-marshes Gulf killifish (Fundulus grandis), the coastal redfish (Sciaenops ocellatus) and the pelagic mahi-mahi (Coryphaena hippurus). Prescilla will explore several cardiac phenotypes on the embryo-larval stages that are indicative of cardiac fitness, to gain a better understanding of the potential effects of sublethal exposure on the future cardiovascular health of the young fish.